How many times a week do you search your shop for a part that you know you have? How often are you running to the store to buy a tool that you’ve deemed lost? A disorganized shop can be the cause of frustration, wasted time, and lost money. Clutter builds up because you don’t know where to put everything. So, take some time to lay everything out and find it a permanent home. Take advantage of bins, cabinets, shelving, drawers, and peg boards. Use labels to help you find specific items and color coding to help you locate sizes. To avoid wasted time, keep your parts and tools within easy reach of every work station in your shop. Spare your hands and knees trying to get parts from the bottom of a bin; store the most-used parts at eye level to make them more accessible. The parts that are rarely used should be stored in the higher and lower spots. Arranging parts based on size will also help you to find what you’re looking for. Having just the right amount of stock in your shop is important. If you have too much, that creates clutter; if you don’t have enough, that creates downtime because you have to go buy the part. Clear off the top of storage bins, tables, and other places that collect a lot of clutter. Once these spots are clean, you can keep track of what you have. Make it a habit to return parts and tools to their homes. This will save time in the long run. Shop clutter even extends to the office. Don’t lose time looking for invoices. It’s 2017, it’s time to start doing your bills online. Most companies have an online bill paying option; if the company you’re paying doesn’t have this option, you can set up automatic bill paying through your bank. 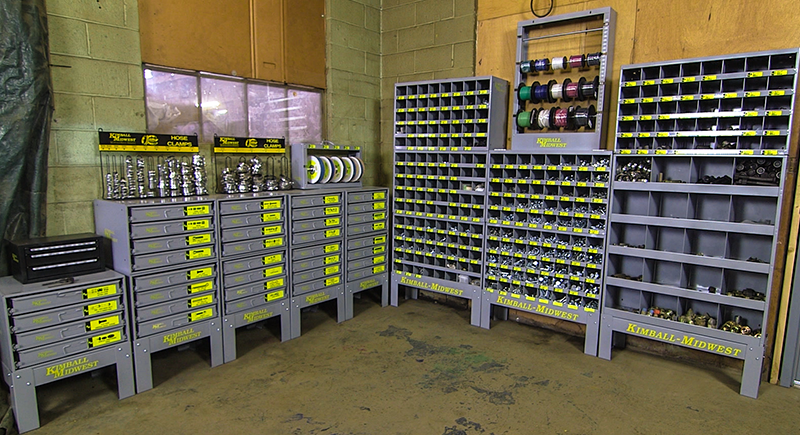 If your shop is big enough, let a vendor take care of the organization. A good vendor will come into your shop, organize it, clean it, and keep it at the right stock. The most efficient option is to have one vendor. That way, you have less paperwork and less people to depend on. Your one vendor would know everything you need, when and where you need it. At the end of the day, you need a shop that encourages productivity and hard work. Having an organized shop will do just that.